The Summer Season of Friday Nights @ OMCA is back! That means the gardens are open for picnics, live music outside is back, gallery hours are open until 10 pm, and the Off the Grid food truck market expands onto Oak Street. Enjoy hands-on activities for kids and a lineup of live music and dance from local performers that changes weekly—all alongside your favorite food trucks from Off the Grid. 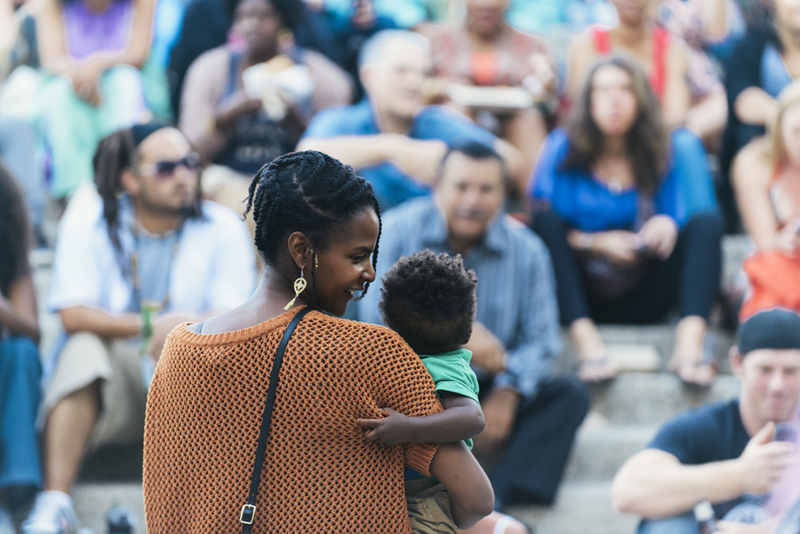 Bring friends and family for a taste of local music, food, and culture at the Oakland Museum of California every Friday Night! Stepping dance workshop with Antwan Davis. Live music from Jazz Mafia’s Heaviest Feather. Draw your own Hip-Hop calligraphy. Explore library resources provided by the OPL’s bike-powered book-mobile. Join a family-friendly story with our friends from the Oakland Public Library. Explore our weekly rotating market featuring local Bay Area artists, jewelers, and craftspeople. OMCA is located one block from the Lake Merritt BART Station. Event parking is available at the Museum for a $7 flat fee after 5 pm. Museum garage closes at 10 pm.